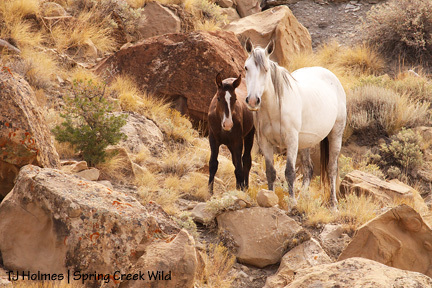 Check out this article from the Grand Junction Daily Sentinel about the wild horses of the Little Book Cliffs. 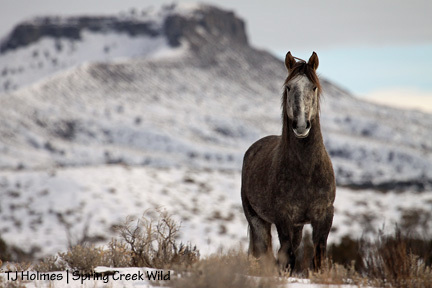 As Marty noted, the reporter didn’t get everything right (one example: no, PZP will not be in “pellet” form in horses’ feed any time soon), but it’s a very positive article about what’s happening on one wild horse range with a strong partnership between BLM and a highly involved advocacy group when the priority is the horses. 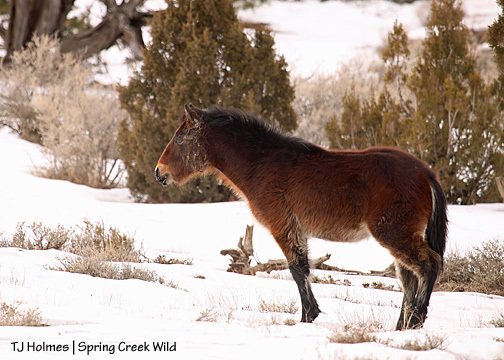 Don’t forget to stay up to date about the Little Book Cliffs wild horses by following Billie’s blog! 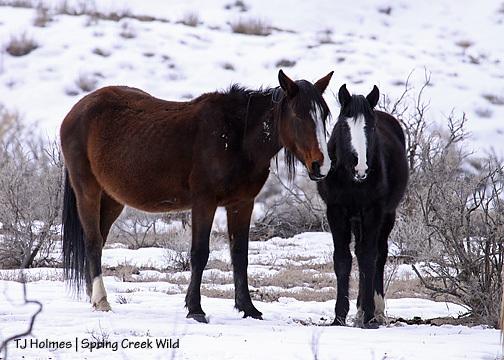 There are a lot of involved folks with the Friends of the Mustangs, and Billie and Marty are just two of them. 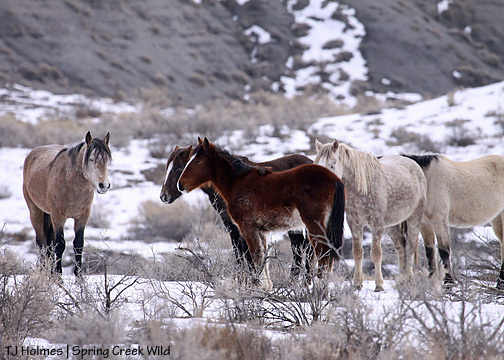 I was very encouraged when I saw the first day of the Little Book Cliffs roundup in September 2007, less than a month after ours in Spring Creek Basin. Volunteers there are involved even with the roundup process, and as a result, the horses are treated much more humanely without the whips and plastic bags and yelling and banging and chaos. 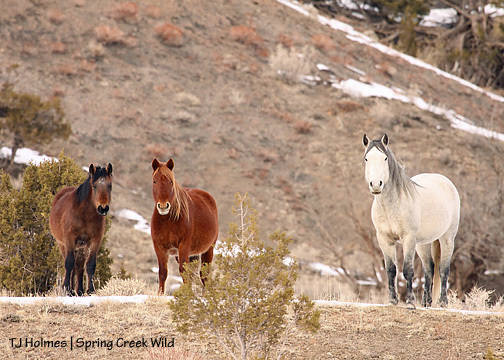 They do still use a helicopter, but family bands are kept together when they reach the pens – a much smaller setup than ours was, and they move to different areas of the rugged range so horses don’t have to run across the whole of it – and, because of their documentation, particular horses are able to be singled out, then the others are released after hours, not days. It was a much calmer atmosphere than ours, and I have been encouraged and inspired by them ever since. With humble acknowledgment of the book with the title Once Around the Sun in Yellowstone, I thought it would be interesting, if slightly late, to share some pictures from (mostly) last year. Every year since I first moved to Colorado in 2001, I’ve done a little calendar for my family. They started out as images strictly from Colorado, but then there was the year when I moved from Colorado to Montana and back to Texas before returning to Colorado on Jan. 2 the following year, so that was a mixed-image calendar. And then last year was, literally, the year of the horse, and family got all mustangs, every month. This year is no different – and I’m late in selecting images – again – which also doesn’t break my typical pattern. But one difference: I thought I’d share the images I selected here on the blog, with a brief explanation of why I selected each – a memory of the day/moment. I think most of the images have appeared previously on the blog, with maybe a couple of exceptions, and all were taken last year except December’s boy, which was taken this January, and all except the October image were taken in the month it represents (October’s was taken in November). 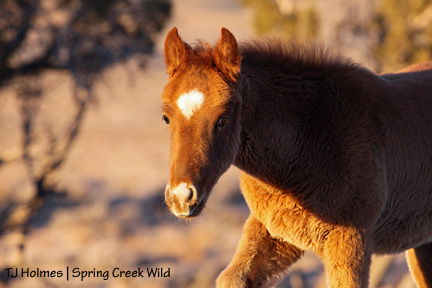 This shot of our littlest wild ‘n wooly, Hayden (thus named because I was in Yellowstone, one of my other favorite places on the planet, when he was born last fall), makes the cover because it was the day after Thanksgiving, and I was having a lovely end-0f-day visit with him and his mama and his new stepdaddy, Chrome. The coyotes were singing and the moon was plump and I didn’t yet know about Molly … and because he gave me this look, full of baby-curiosity. Hayden is the son of Grey/Traveler, which careful readers know is my beloved favorite ( 😉 ), and he has had my heart since I first laid eyes on him. 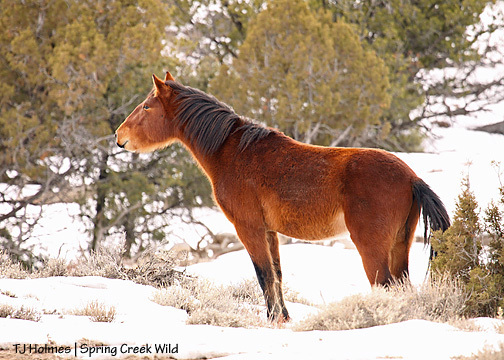 I hope he long carries on his daddy’s legacy in the wild heart of his western Colorado home. Speak of the handsome devil, here’s Grey/Traveler as Mr. January. You can see that last year’s January doesn’t begin to compare with this year’s snowy January. The band was on the west end of the corral hill – almost to the boundary fence. You can just see the base of Filly Peak at right, and in the far background are the La Sal Mountains of Utah (on the other side of which is Moab). I love starting off the year with my boy! Ahh, happy days. 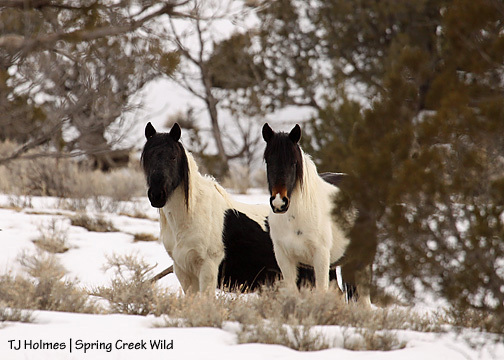 Duke and Chrome were still bachelors last February, still part of the even-then loose-knit Bachelor 7, and they were shadowing Steeldust’s band this day, back in the area southish of the roller-coaster ridge. 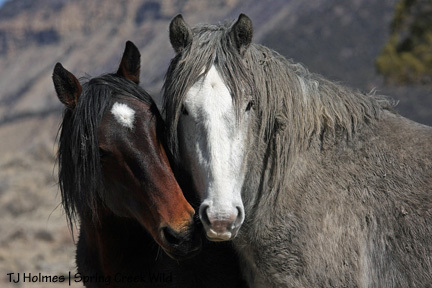 Sometimes, I have to see the pictures at full resolution on the computer screen to know what I have, but with this moment, as it happened and as I hit the shutter, click after click, I knew I had something special – the capture of a bond between stallions, friends, before the spring frenzy. I had walked out to the band and was sitting on the ground enjoying the visit while they grazed … and then they walked toward and past me, bringing the sounds of their lives with them – hooves on ground, lips and teeth nibbling, gentle snorts as they came – and went – and me, near-breathless at the seeming miracle of their wave on wave. As it happened, Duke stole Raven and her filly, Corona, in late April and had them most of the year until Kreacher stole them back and injured Duke in the process, and Chrome ended up dogging Grey’s band around the end of the summer, persistence that finally paid off when he stole Jif and Hayden about three weeks after he was born … and then acquired Two Boots and her colt, Cuatro, and now presumably has Iya as well. Well … what can I say? 🙂 This image has been my desktop image since then. A magical combination of roselight and gorgeous grey and wild life. Shot across an arroyo as he came up from water in the bottom. This picture was taken after I knew Bones was gone. 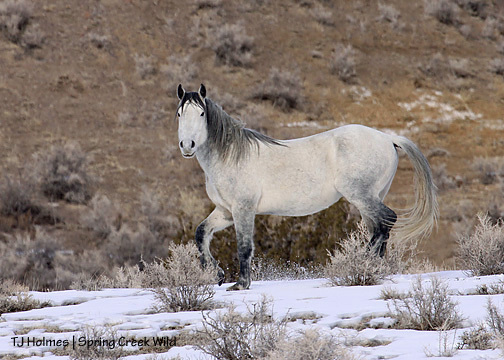 Roach (pictured) and Poco were grazing alone on a ridgetop. I hiked out, hoping Bones was just over the edge, just out of sight. She wasn’t, and I knew. I walked the whole ridgeline, looking hard on both sides, still, just in case. 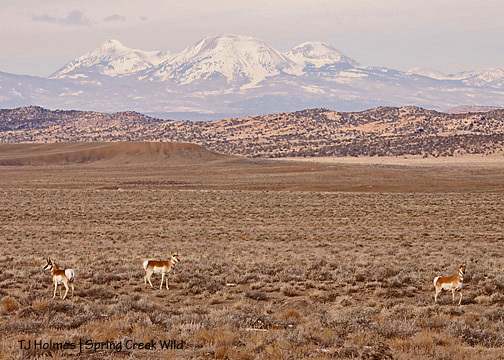 When I walked back, Poco was leading the way at the base of the ridge, toward an arroyo. I waited till they were on the other side, then followed while they stood there, facing me, watching. On the other side, he led me farther into a narrow valley until he stopped again and faced me again and watched me again while I watched him back, then sat, then got up and explored among the trees. He never moved. Behind him then, motion – a golden eagle launched into the air, and I found what I had dreaded: Bones and her partially born foal. Indeed one of the saddest times I’ve had in the basin. I couldn’t bring myself to use a pic of my bonny Bones, so I used this picture instead, a beautiful picture. It reminds me, though, and that’s enough. Oh, this one I love. 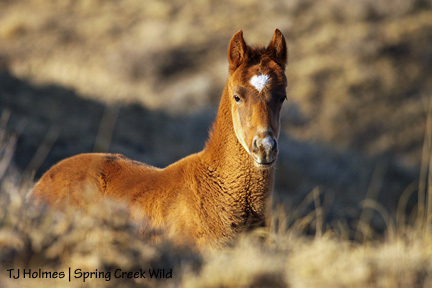 This was a day or two before the wild horse count by the Four Corners Back Country Horsemen, and I was out till the very end o’ day, captivated by young master Sage, racing the wind, testing his legs and lungs and baby muscles running circles around Auntie Baylee. Then it was back to mama for celebration, dinner and a nap, and there he is, after sundown, all at peace, Piedra calm, watching over her firstborn son. I tried not to repeat horses (too much), but I couldn’t pass this one by. That’s Sage and his Auntie Baylee. She was just 2 last year and a great playmate and babysitter to her sister’s (I think) son. 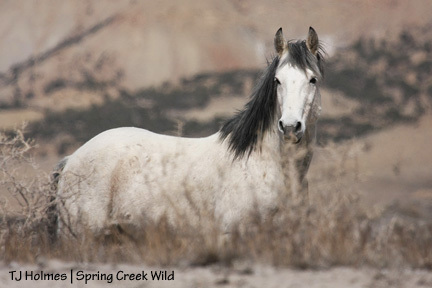 It was a dry spring, and a windy one, and I love the greens and greys and their wind-tousled manes and tails, not to mention their obvious bond. 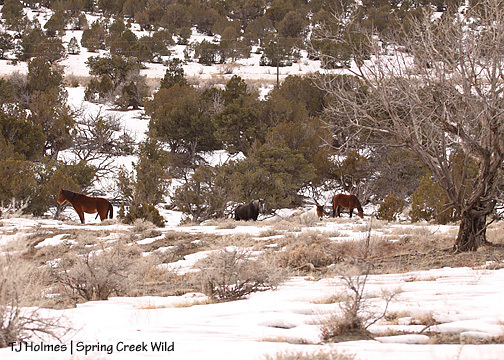 If ever there was an image that said “I am wild … I live in Spring Creek Basin,” this is it, I thought that day. Duke and his family I hoped he’d have forever, napping in the summer light, McKenna Peak and the unnamed – but absolutely recognizable – promontory in the background. 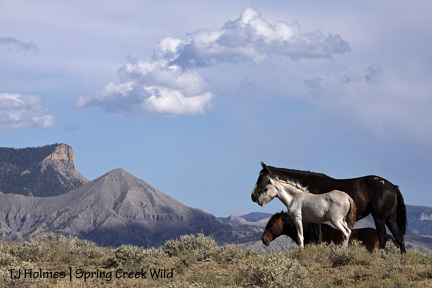 Saltbush and mustangs and eroded hills, jutting buttes and clear blue sky … it could be mustangs anywhere, but it’s Spring Creek Basin. Duke’s always-home … and now, hopefully, Raven’s and Corona’s, too. If you had such a subject, no doubt he’d appear multiple times in your calendar, too! This was early in the time when Chrome started following Grey’s band, and this image happened when Grey chased Chrome away – toward me. Chrome broke off when he realized I was sitting there, and Grey trotted back to his family. 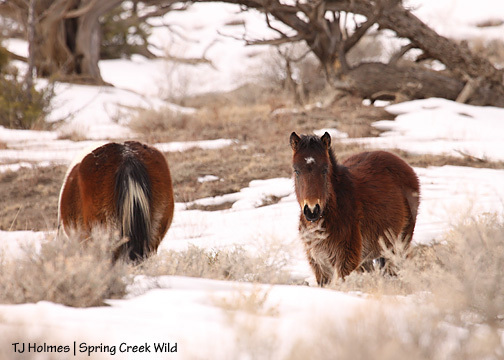 Toward the end of last year, the ponies started appearing in high places, on hill sides and tops, places I had rarely previously seen them. Untouched forage, maybe … maybe a breath of cooler air above the basin floor. Houdini and Terra pictured. 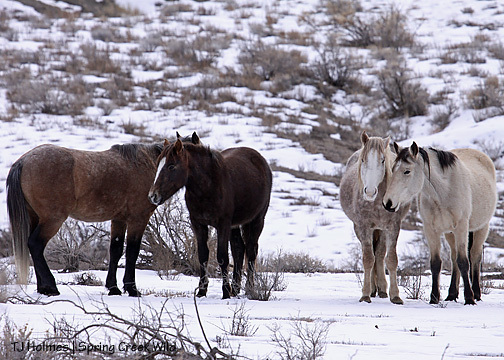 Iya was just to the left out of this image, and Two Boots and Cuatro – and Chrome – were higher to the left. 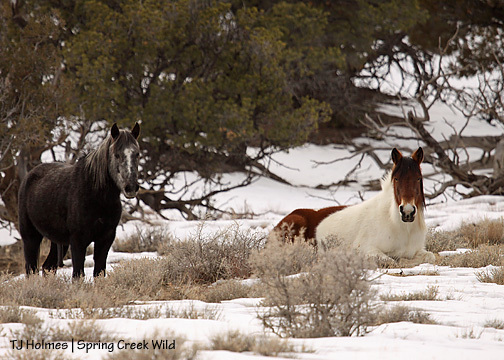 Grey/Traveler and heavy-pregnant Jif were napping at the base of the hill, and Kreacher and Mona and Kootenai (Raven and Corona still with Duke then) were wandering, grazing, between the hill and the road. Unique placement made for unique – to me – photos, and, on their own, reminds me of Little Book Cliffs terrain. What a fine morning this was (actually in November)! First-thing-in-the-morning sunshine gave way soon after this image was taken to high clouds, but this was quite a lovely morning. 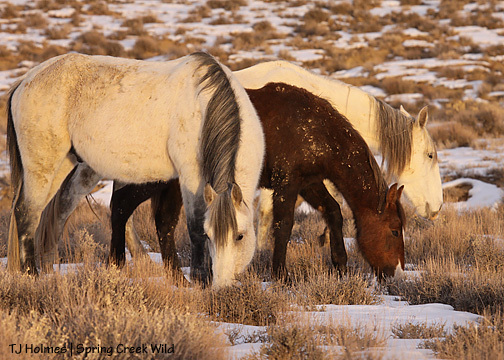 Chrome had stolen Jif and Hayden by this time, and Iya was vacillating between her band – very close by – and Chrome’s. So many images to choose from for this month, from this morning alone, but this was the one. He’s so much like his daddy. Another beautiful morning (and cold) … but this one, tempered by sadness. 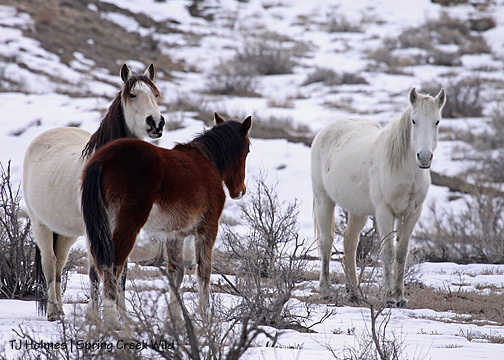 This was the morning I realized Molly was gone, when I found her filly Liberty, right, with Bounce’s band. 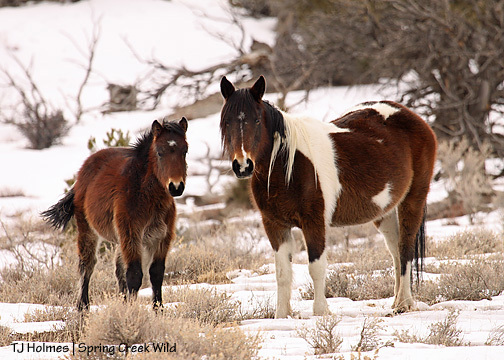 Here, she’s with yearling Gaia. Molly and Liberty spent at least a few days with Bounce’s band after they left Seven’s (Liberty’s sire), and I was hopeful they would adopt her when the time came. 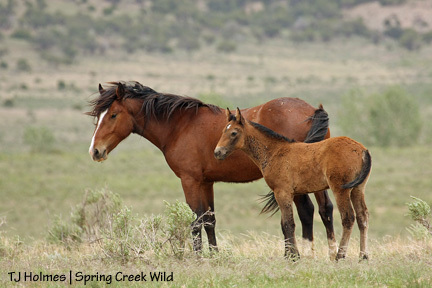 I am happy to report that as of at least earlier this month, Liberty still has a place with wise Bounce and his young mare, Alegre, and her babies, Gaia and Whisper. Surely you’ll recognize handsome Hook! This was taken most recently, in early January of this year. This was the day I realized former bachelor Hook had stolen Hollywood’s lovely mare Piedra and her colt (and Hollywood’s son), Sage. 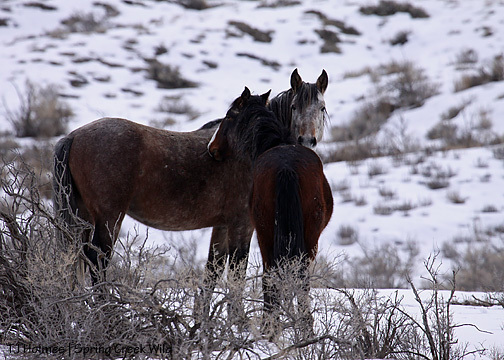 I had had a wonderful visit with Steeldust’s band just earlier, then spotted these horses farther away … then made the surprising ID. Cloudy, snowy, wintry. Wild in winter. Again, I wish all of you a wonderful year, filled with horses and kindness, and I hope that in December, you all have a year beautiful to look back on … another “once around the sun” … and may it be filled with more light than shadows. 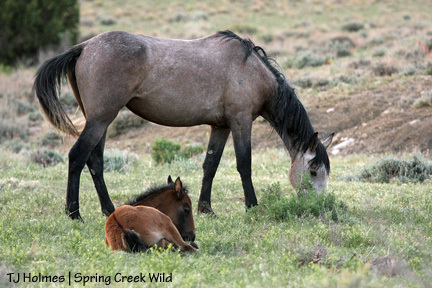 If you have questions about PZP, I would encourage you to trot on over to Matt Dillon’s Pryor Wild blog and read his excellent series about this fertility control. To read it from the beginning, scroll down and click “older posts” to get to the start, which has a schedule of topics, or there’s a new schedule on the home page with links to each topic. I think you’ll find it an extremely informative series with practical information. 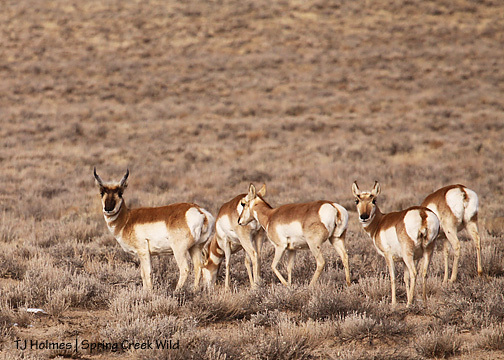 Involved advocates are in favor of a PZP program in Spring Creek Basin, but despite the fact that BLM is pushing PZP in seemingly every other herd area, BLM is resistant to its use here. 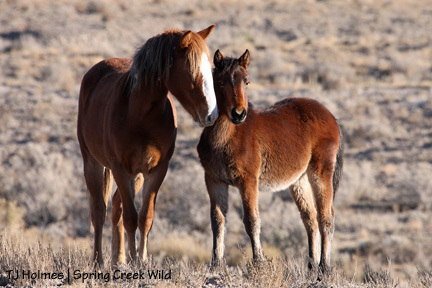 As small as our herd is, and with 100 percent documentation, and the fact that it will keep costs down in the long run – and keep wild horses wild – I can’t figure out why, so we continue to push. 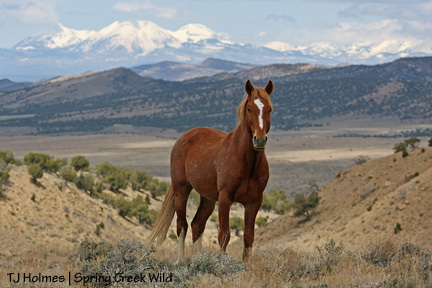 With all the practical information available and the fact that Salazar himself says it can be used “responsibly and at a reasonable cost,” there’s no reason we shouldn’t be using it to prevent what I hope we all want prevented – loss of our horses in the wild. Thanks, Matt, for putting the information together in a logical, easy-to-read way! He’s shadowing Steeldust’s band (which still includes Aspen after his buddy Hook went and stole himself a little family). He’s keeping a pretty respectful distance, and he’s still limping, though not even as much as when I saw him last (I even saw him trot!). He looks OK, as you can see from his photo. Thin but not terribly so. It was a welcome relief to see him feeling better that he’s showing signs of wanting company again – and able to pursue that company. Luna has to lift her head high now to accommodate growing girl Hannah, who was looking for a mid-morning snack. Alpha at right. Mouse and Ember, Sundance and Kestrel. Mouse only barely on the outskirts. 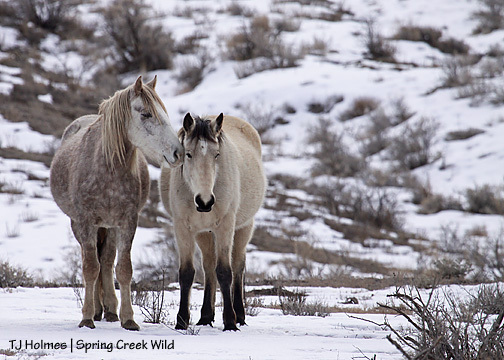 He and Sundance had a little scuffle a little later, but it lasted just seconds, and they were right in the middle of the band with nary a disturbance. The dynamics are amazing. Also saw Hook, Piedra and Sage, still together; Grey/Traveler, Houdini and Terra; and way out, Kreacher and his girls. There were at least three bucks with the large group (maybe two dozen?). I SO lucked out coming along to get pix (from the Jeep on the Disappointment Road) of them with the La Sals in the background! This is looking northwest across the northern end of Disappointment Valley. 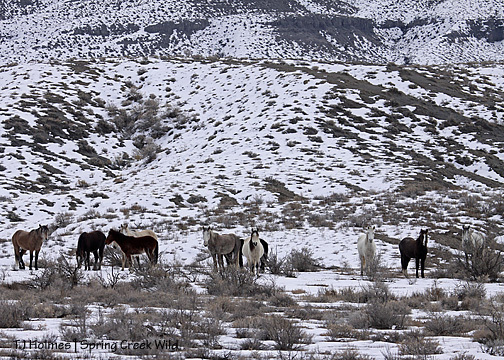 Steeldust’s and Hook’s bands were visible in the interior of the basin from as far as I was willing to drive in on quick-thawing roads. Cattle were visible, too, of course. It’s rather annoying to spot more cattle than horses. Dunno how many are in (200-some?). Every day, their days are shorter. 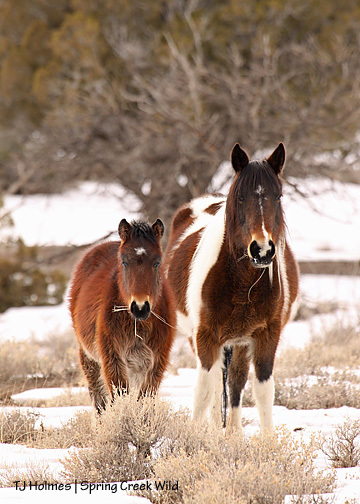 From the county road, a welcome sighting – especially because I hadn’t seen them for a while: the pinto band. When I hiked in to visit them, another welcome surprise: Seven’s! They were fairly close to each other – the bands – but out of each others’ sight. I went first to see Seven’s. I kept my visit with them short and went back to find the pintos. As it happened, I came over a hill with them below me. Little Milagro was first to spot me, and we exchanged seemingly conspiratorial glances for several minutes before anyone else became aware of my presence. That’s mama Kiowa at left. 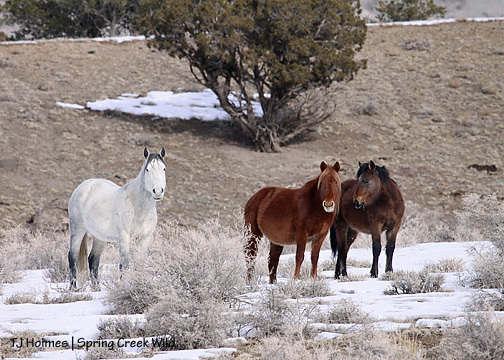 Milagro and Kiowa were up the hill to the right; Corazon, Spook and Reya were down a little farther to the left. 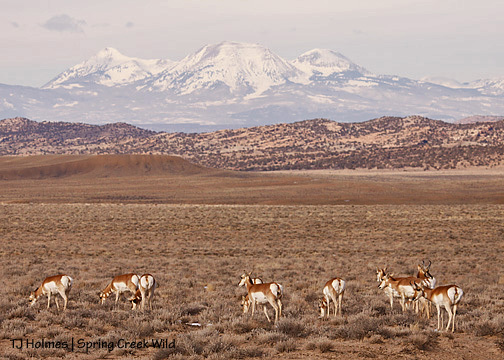 You can see Copper, Ty, Chipeta and Mesa. Copper, nickering to Spook and Reya. But silly boy … he didn’t go down to them. Shortly after Chipeta realized I was there. 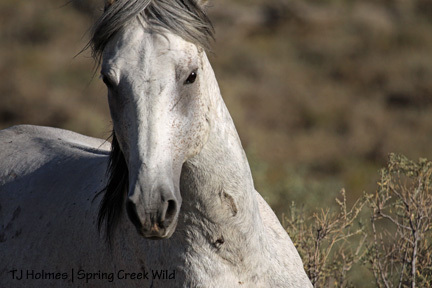 I had sat down on a bare patch of ground and was focused more on Milagro. It was several minutes later before she decided to get up – and stretch. 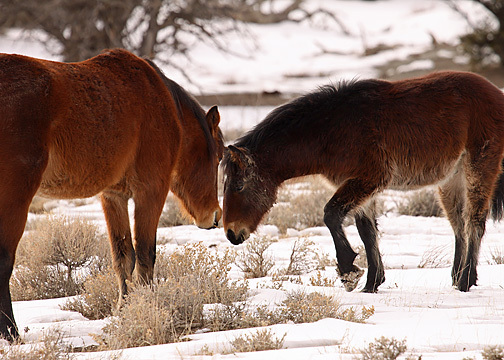 At this point, Kiowa – head down, grazing – still hadn’t realized I was there (or so it appeared). And there they are together. And the boy and his mama. He got her bay shade but not her spots. 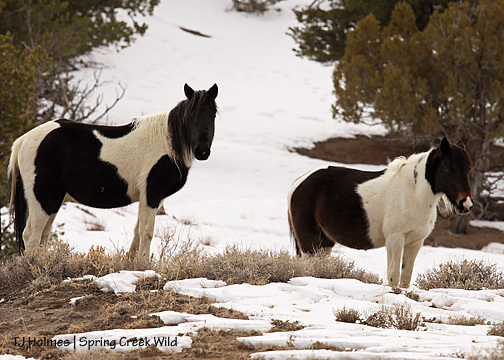 Milagro’s sisters: Spook, left, will be 2 years old this spring, and Reya will be 3. Different angle as I was leaving them – Reya hadn’t moved. Spook moved on, and Corazon, left, moved up to stand/nap with Reya. I’ll leave you with this mama-son portrait. (That’s not timothy. ;)) Don’t you love how fuzzy and wonderful they look? *Making* room? 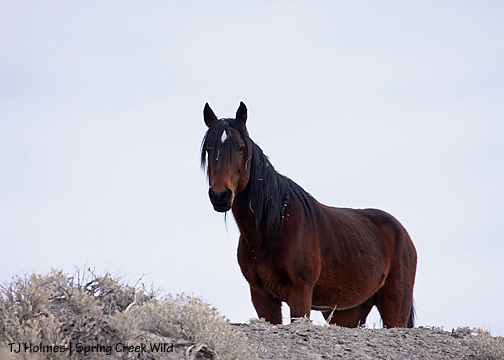 For wild horses that already have been granted homes? Decades ago? He makes some good points, does Salazar. Unfortunately, for those few, he follows up with gobbeldy-gook and double-speak … just what we’ve come to expect from government, I guess. And he completely, totally misses the mark. 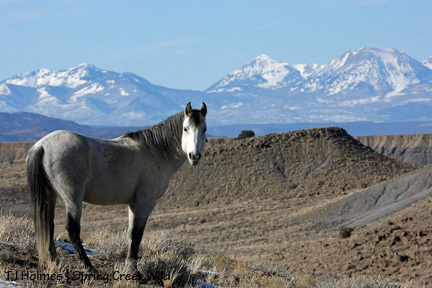 Wild horses HAVE homes, and Americans want them to stay on their home ranges. *Make room* for the other crap, somewhere else. The arrogance (among other things) is astounding. 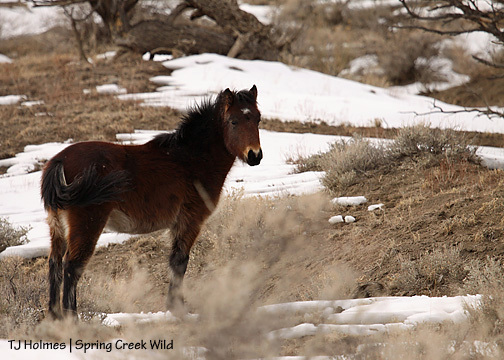 In January 2008, with much inspiration from Matt Dillon (Pryor Mountain) and Billie Hutchings (Little Book Cliffs), I started this blog as a way to share all I learn about the wondrous, complex, amazing, simple, fascinating, ever-dynamic lives of the wild horses of Spring Creek Basin. 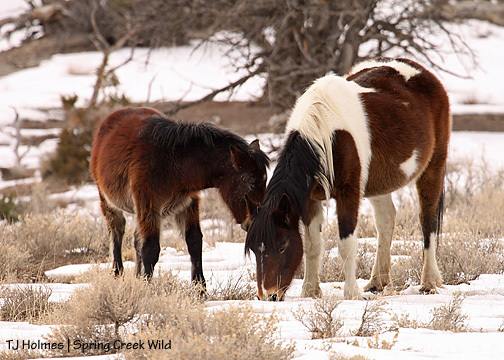 Two years later, your nearly 30,000 visits have proven to me what they already know: People want to know about the lives of wild horses IN the wild.